Like me, my mom likes cooking and baking equally well and she made lots of yummy treats over the 18 years I spent in her house. This cake was a staple and probably the thing she made most frequently. As a child, I had problems with it. And truthfully, as an adult I struggle with it a bit too. You see, I like nuts. I like them alone and I like them in savory things, but I don’t like them all that much in sweets. Never in ice cream, and I prefer them to be absent in cookies, brownies, cakes, what have you. I make an incredible nut tart around the holidays and the only reason I know it’s incredible is because people have told me so. I have never tried it. I make this cake because other people don’t seem to share in my uncertain feelings about nuts. People LOVE this cake. 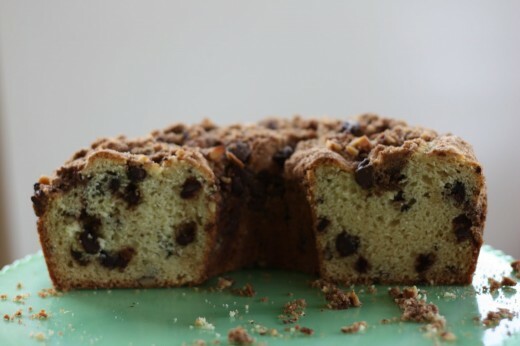 Everyone from the very young to the very old feels passionately that it is the best coffeecake. Who am I to argue? For me, it does have some very redeeming qualities. There are the chocolate chips of course and lots of struesel topping. The cake part has a full cup of sour cream in it so it is very moist. It can be made a day in advance and it also can be frozen for up to a month. Most of all, it is truly a crowd pleaser and it’s great to have a few of those in your cooking or baking arsenal. What are your crowd pleasers? Grease a tube pan (also called an angel food cake pan). In a large bowl, beat sugar and butter at medium speed until lightened in color and well-combined. Add eggs, vanilla, and sour cream, beat until mixed well. Add flour, baking soda, baking powder, and salt and mix until just combined. Mix in chocolate chips and nuts by hand. Scrape batter into pan. For the struesel: In a medium bowl, combine flour, brown sugar, cinnamon, and cocoa. Using a pastry cutter, two knives, or your fingers, cut in the butter until the mixture resembles coarse crumbs. Stir in the nuts and chocolate chips, then sprinkle on top of the batter. Bake for 50-60 minutes, until a toothpick inserted into the cake comes out clean. Place on rack for 10 minutes. Carefully turn cake out on to rack upside down, then using another rack placed on the bottom of the cake, re-invert to right side up. Allow to cool completely. I know what my 5 boys will be eating this afternoon after school! I posted about comfort foods I remember from my childhood today too! The struesel topping looks fantastic! And, the nuts sound good to me. I guess my crowd pleaser is cinnamon rolls. I found your blog thru “Tastespotting”…this cake looks delicious! I have all the ingredients in the fridge so I think I’ll be making this for breakfast today. Oh, and I like most nuts but not *gasp* walnuts. So I’ll prolly either leave the walnuts out or use another type of nut. have you ever made this recipe without nuts? i’m curious if people prefer one or the other. it sounds very enticing but alas, i’m not one for nuts either! I feel the exact same way about nuts- I really dislike them in baked goods or any sweets for that matter (even things like peanut m&ms!) but I love them on their own or in pastas, salads, etc. I seriously don't know anyone who feels the same way about nuts so this post made me laugh! 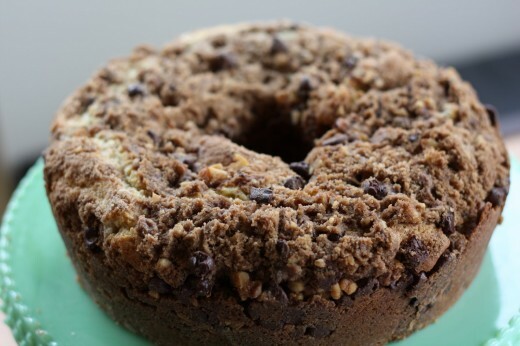 I have never had coffee cake with chocolate chips before- it sounds like one of the best ideas I've heard in awhile! i am with you on nuts– they do NOT belong in cookies or brownies or cake! i don't like peanut m&m's either! (i swear they use only the peanuts that aren't good enough to go in a jar of JUST peanuts!) i would try making this cake without the nuts as well. i think it would be FAB! I’m so glad to read that there are others out there who aren’t into nuts in dessert. I am the only one I know! Sheree, I think you could add pecans or hazelnuts and it would still totally work with the cake. Nut-dislikers, I think you can leave the nuts out. There is only 1/2 cup in the whole cake, so I don’t think their absence would matter. I’ll try it that way next time! That certainly looks like a crowd pleaser. Mine would be my mum’s easy as apple pie recipe. Girl girl girl, I have got to make this cake and I mean soon. I spent like an hour online looking for the perfect dessert to bake. I already jotted doing the ingredients on my grocery list, some in which I already have in my kitchen because I love to bake and this just to cake I want to bake for my Sunday brunch.